"What do you put in that?"... is the most common question. 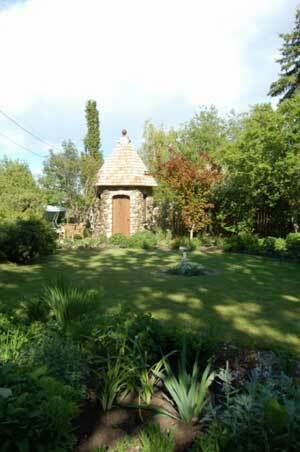 Our little garden Oast House draws a lot of attention, and ads a little whimsy to the garden. “Ok it adds a lot.” Katrina always wanted a little garden folly and when she visited Ohio in the summer of 2007 we saw a beautiful example and knew we had to have one. One of the most familiar sights to travelers in southeast England is the distinctive conical or pyramid-shaped Oast House. An Oast House is a freestanding kiln for drying hops for which is an important ingredient for “ale”. 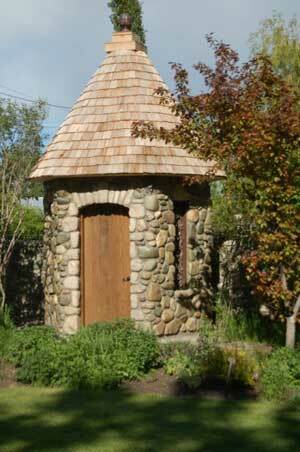 There are usually 3 rooms in an oast; the kiln (oven), the drying room, and the cooling room. 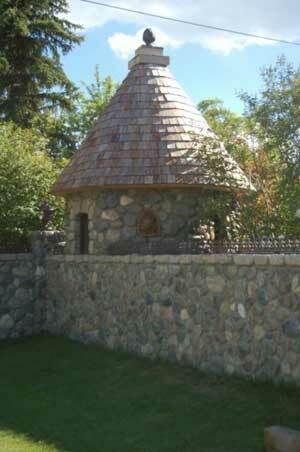 Kilns were fired by wood until the 17th century, then by charcoal, and more recently by oil. The hops were dried in the drying room usually located just above the kiln, then dragged into the cooling room, before being pressed or baled into packets for transport to the breweries. 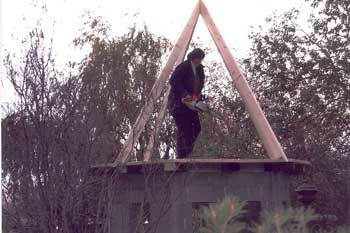 The distinctive conical roof of the Oast is necessary to create a good draught for the fire. The steep, pyramid-shaped roofs and curvaceous roundels of traditional oast houses are a familiar sight in the south of England. But while these distinctive buildings are a much-loved part of architectural heritage they still seem curiously exotic. 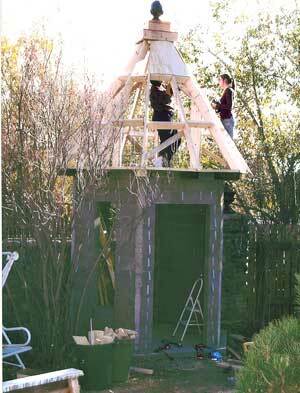 Work began on the little garden retreat in July 2007. Jan Monnissen the stone mason from Back Diamond mapped out and built the walls. With no plan and a great idea Katrina and her staff where undaunted by a round roof. So hammer in hand, chain saw at the ready, the Vale’s Greenhouse staff, of Sarah, Sierra, Elliott and Katrina spent several frustrating days trying to get the curve just right. Anyone can build a square roof line but a curve proved to be harder than it sounded. As you can imagine everybody had an idea on how it was to be done. Even though this little house does not have three rooms and will never dry hops we still call it an Oast House. An great little addition to any garden.